As confirmed before, it is not easy to make the pick. If you have not read Part 1 and 2, I recommend you to search for them and read them first. 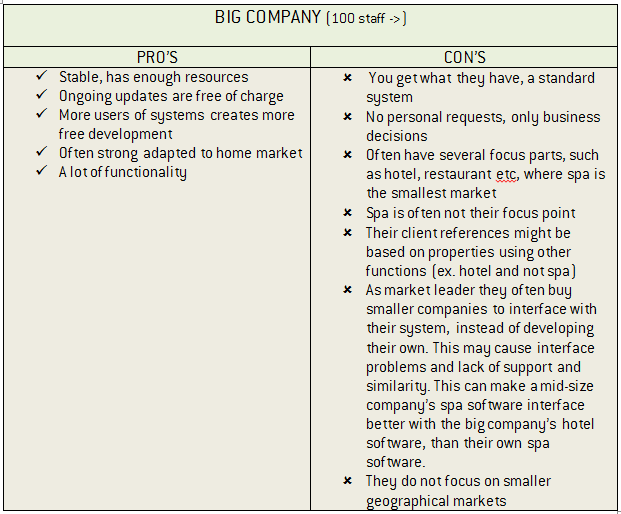 How can we compare the different spa software vendors to each other? In the segments below we compare small vendors to mid-size and big, to show what you can expect from each type of company. I hope these three posts have helped you to understand the spa software market a bit more, and remember that it is always important to look upon what you really need for your own facility.